Stress testing is a simulation technique used in multiple industries to determine their reactions to different unexpected situations. In software testing, you can benefit from stress testing by showing how the application behaves under extreme load conditions. Shortly, stress testing is used to find the limit, at which the system or software or hardware breaks, by testing with overwhelming data or resources. Stress tests are usually cloud simulation models that test hypothetical scenarios, also highly customised stress testing methodology is also often utilised. Use stress tests to test the stability & reliability of your system and infrastructure. These tests determines the robustness and error handling under extremely heavy load conditions. To reveal application bugs that can appear only under high load conditions. These issues can include race condition issues, memory leaks, and others. Stress testing allows you to simulate and identify the application’s weak points. For stress testing to be successful, the application should display appropriate error message while it is under extreme conditions. You can have a web server, that can be stress tested using various scripts, scripts, requests, bots, and various denial of service tools in order to have a better understanding of the performance of a web site during peak loads.It monitors system resources such as CPU, memory, I/O etc., and checks the ability of the application to recover back to normal when the workload is reduced. We test your website for free! Get started here! Let us do the testing for you every month or every release. We test your website, web services or APIs before any live release. This way you can ensure to release with much more confidence and don’t get any regression bugs. The first report is free, all you have to do get in touch with us. Customers conversion rate is a very important metric for every online business, even if you have a simple website, a blog, an ecommerce marketplace or a complex platform. At LoadFocus, we saw this as an opportunity to add a new service under the same plans, a service which will help you keep an eye on the speed of your website and be able to always compare with any on your competitors. We wanted to make it easier to monitor any changes that happen on an hourly/daily/weekly or monthly basis with your website, how it renders and how it loads comparing to your top competitors. LF Page Speed Monitoring is an easy way to monitor speed of your website from the cloud with LoadFocus. To put it simply, Page Speed Monitoring is like running a Page Speed Testing, but instead of giving you the full report once, you get it every day. It’s a technology that allows you to schedule Page Speed Tests as fast as every hour and you get alerted when your test runs and if anything changes comparing to your previous runs. The best part? You can see how your website rendered for each run, we take full page screenshots for your website and your competitors along with full performance metrics. LF Page Speed Monitoring provides an easy option to monitor all your websites from the cloud. LF Page Speed Monitoring alerts you when changes occur for any of your websites or competitors’ websites. All you need to do is add your website URL, specify the email addresses on which you want to get alerted for reports and changes, define your competitors, and launch. With Page Speed Monitoring, you have flexible configuration options to closely match your monitoring needs and this services comes along within the same existent plans. Setting up a new monitor with LF Page Speed Monitoring is a matter of seconds, just set schedule time for page speed tests to run on a regular basis and get notified when tests changes happen or at every run. LF Page Speed Monitoring is available today. The Document Object Model (DOM) is an object-oriented representation of the web page, representing the document as nodes and objects (HTML tags), which can be modified with a scripting language. DOM is a programming API for HTML and XML documents. The DOM is created when the webpage loads inside the browsers, HTML you write is parsed by the browser and turned into the DOM. So, if you are using Ajax to get content from elsewhere, the DOM is going to be very different than your original HTML, similar happens with client side templating. 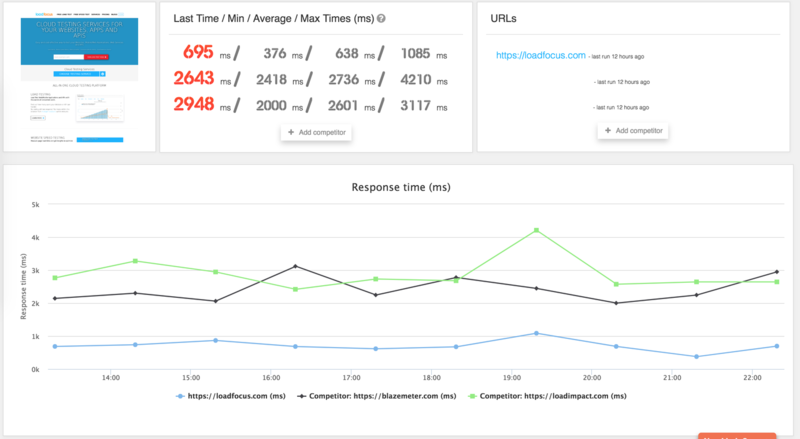 So you’ve run your first free load test with LoadFocus. What’s next? The main goal of load testing is to see whether the application can sustain the increased load on the server or will it crash the server. Your applocation can be a website, some API or web serivices you use or expose to customers, a wordpress blog or any other public URL that you expose. Also, to identify areas in the architecture of your application which don’t function properly, either too slow or not functioning at all. Load Testing would provide data for rendering or doing different actions on the website with a number of concurrent users and still have a good performance. There are a few prerequisites that you need to gather in order to run a successful load test assessment. Enter you Analytics tool and gather the top 3 locations from where your customers access your website or web services. Also, find out how many users accessed your application per second. Define supported councurrent users/second, expected response time and any other client side (lantency, hits/second) or server side (CPU, Memory etc) performance metrics you want to consider. Check the HTTP method for your tests (GET is the request done by browsers when accessing a website or an API endpoint) and protocol (HTTP vs. HTTPS). Have in mind that this number may change in the future, when you send a big email campaign or post a new viral article on your blog. So you need to be prepared to handle this new load in order not to lose potential customer or get SEO downgrded, because of your slow website (system under test). And create the proper load testing scenarios to simulate hits from your customers’ locations. Start with a small number of clients (1, 20, 50, 100 concurrent users / second). Try to increase the number of the clients gradually to understand how your API, Website or WebApp behaves. Load testing is an iterative process. Once you find one issue, you need to re-run the load test and find the next! Run your free load test today! 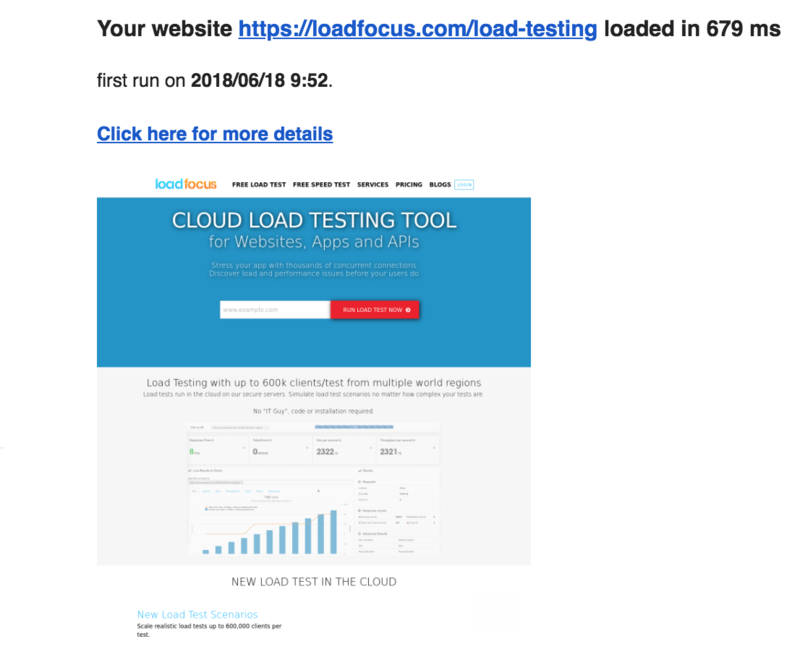 LoadFocus is cloud Performance, load and stress testing tool which provides the infrastructure and the ability to run all these tests in less than a few minutes, keep history of the results, compare different runs to inspect performance improvements or performance degradation. load tests results will be publicly available. In order to understand better how your websites or APIs behave under more load, you can create an account by clicking here, and create different load testing scenarios with up to 1000 concurrent users, from multiple locations, for up to 10 minutes per test. Identifying potential issues, when multiple users access your websites or web services at the same time, is very beneficial and helps conversion rates. Give it a try and run a free load test today!